The NEC NP-V302H is 3000-lumen DLP mobile projector with 8w speaker, dual HDMI input and ECO Mode™ technology. The projector has horizontal & vertical keystone correction, PC frame sequential at 120Hz and geometric correction. It features quick power-off, advanced AccuBlend, AutoSense and built-in wall color correction. The NP-V302H also features direct power on/off, closed captioning and virtual remote. This filter free projector is 3d ready and includes computer, composite inputs and RJ45. 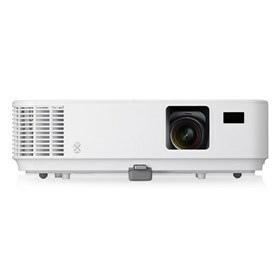 It is designed to provide higher brightness for classrooms, meeting and conference rooms that have heavy ambient light but require a small projector. The NEC NP-V302H has many exciting features for users of all types. See the NEC NP-V302H gallery images above for more product views. The NEC NP-V302H is sold as a Brand New Unopened Item.